Researchers at the University of Waterloo have developed a sophisticated wheel unit. The self-contained unit combines a tire and wheel and an electric motor with braking, suspension, steering and a control system in a single module designed to be bolted to any vehicle frame. Use of this module would free manufacturers from making huge investments to develop those components from scratch and enable the economical production of specialized vehicles in even small quantities. Vehicles could be affordably produced for a wide variety of specialized purposes using a sophisticated wheel unit. 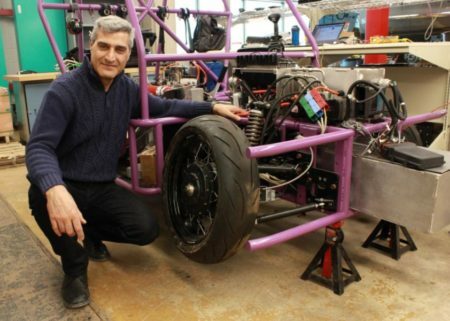 Prof. Amir Khajepour stands next to a vehicle containing his new wheel unit. Image Credit: University of Waterloo. Click image for the largest view. One can look forward to seeing this someday as its a very good idea. Its actually possible now with the acceleration of electric powered vehicles. The barriers out there for road use are substantial, though, just starting with the bureaucratic maze, various national rule sets ad infinitum. But the optimist may see this the other way as the high strength suspension, motor and brakes are all engineered in. That offers unlimited innovation potential for everything else. Methinks I need three for my project . . . The research paper, Development of A Novel Integrated Corner Module for Narrow Urban Vehicles has been published in the journal Proceedings of the Institution of Mechanical Engineers, Part D: Journal of Automobile Engineering.